We begin with a small clarification that, when talking about size 12 to 15 rings for men, we refer to the U.S size charts. It would be right to say that these rings fall in the category of big rings for men. It is not very often that you will come across ready made men's rings in large sizes like, 12,13,14 and 15. There are some very logical explanations for this the most important being that, large rings for men are not often requested. 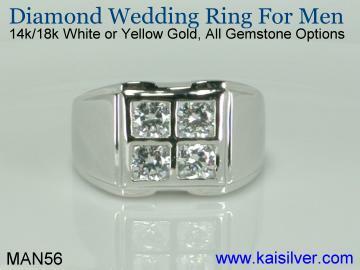 At Kaisilver ring size 15 happens to be the largest size that we have ever crafted. These big rings are best custom made mainly because, they generally require some unique features that might not be easily found in rings sold off the shelf. This report will be divided into two broad sections, the first will discuss the essential features of men's gold or 925 silver rings in the size 12 to 15 range. In the second section, we will offer some interesting suggestions of design concepts that are suitable for men's large rings. Keep in mind that, all Kaisilver jewelry is fully custom made, you choose the design, metal, dimensions and gemstones for your jewel. You could pick a men's ring from our website and request for it to be crafted as a men's large size ring or, send us your own design ideas in the form of sketches or images. Dimensions: Rings typically have a head size (front) and a width behind the finger, rings that have a uniform band width all around are commonly referred to as band rings. If you were talking about men's size 12, 13 or larger ring look for a minimum head height of around 1cm or 10mm. The portion of the ring that goes behind the finger might not always be visible but, maintaining it at a minimum of 5mm to 6mm is a good idea. Recommendations for the maximum ring dimensions for ring size 12 to 15 are quite general, so just keep them in mind. 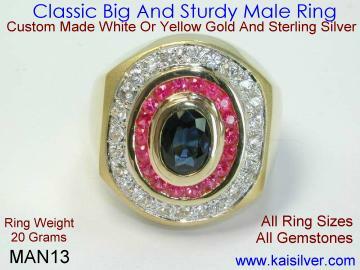 If you wish to make a men's big ring give some thought, if the ring head size goes beyond 1.8cm to 2cm (18mm to 20mm). Personal tastes and likings can vary so, use this information just as a guide - follow your mind and heart. Metal: The calm and confident look of sterling silver has always been appreciated for men, this explains the high demand for men's silver rings. Men's silver big rings can deliver quality in terms of workmanship, gemstones and durability at a price that is far more affordable as compared to size 12 to 15 men's rings crafted in gold. You need to remember that all the three quality factors that we just talked about, can be provided for both gold and silver rings. You just need to work with a jewelry provider who is committed to quality, irrespective of the dollar value of the order. Kaisilver uses the same team of fine craftsmen, expert gem cutters and experienced quality control staff to produce and monitor gold and 925 silver jewelry. This proves our passion and dedication to deliver quality jewelry irrespective of, the price range. Weight: It might seem obvious that men's big rings that fall in the size 12,13,14 or 15 category need to be heavy but, just calling them heavy rings for men, could leave an important issue unexplained. A better way to explain the metal weight of large rings in this size range would be to say that, the metal weight should be proportionate to the ring size and the overall dimensions of the ring. If we are talking about mens big silver and gold rings, there is a technical issue that we need to understand. Silver has a specific gravity that is much less than that of gold, this has a relation to ring size and metal weight. If you had to weigh the same volume of silver and gold, gold would be much heavier as compared to silver. The ideal weight for a big mens ring would depend on design, dimensions and required ring size but, here are some useful parameters. If you need a men's silver ring that is around size 13 or thereabouts (range 12-15), give a close look to the metal weight if it is not in the 20 to 30 gram range. For a men's big gold ring in these large ring sizes, expect to get a weight of around 25 to 35 grams. Durability And Comfort: You want your jewelry to last for long and stay in shape. Durability should be crafted and designed into every jewel. The type of gem mounting used in your men's large ring, the overall workmanship and the metal weight assigned to the jewel are some factors that will influence just how durable the ring would be. Don't forget that each gemstone has its unique characteristics and these, need to be considered when the gem is set, worn or cleaned. Large rings are often crafted with lower than required metal weight, this makes them thin and vulnerable to denting and deforming. Heavy metal scooping inside the band, can also make your men's big ring uncomfortable to wear for long periods. Gemstones: Mens size 12 to 15 gemstone rings generally prefer larger gems. The idea of cluster rings that show a formation of many smaller gems is not very popular in men's jewelry. The requirement of large gems for big rings can pose a price challenge when picking gems like, ruby, sapphire, emerald, tanzanite and even tourmaline, iolite and aquamarine. These gems in medium to good quality, carry a premium price as the carat size of the stone moves up. Innovative designs and the right selection of gemstones, can provide attractive options. We have had several requests for men's rings with sizes like 13, 14 and 15 with gem selections that include, blue lapis, smoky quartz, african amethyst, citrine, carnelian, green jade, chrysoprase,red garnet, blue topaz and white topaz. These gems are quite affordable even when selected in large sizes with good quality features. There is an interesting fact about men's rings with no gems. These jewels do not need to budget for the gem component, they are also easier to wear and maintain since you need not worry about the gemstone getting damaged! And if you think that a men's big ring with no gem might appear too dull and lifeless, talk to the experts at Kaisilver and review their suggestions. Craftsmanship: Not so long ago men were given to believe that, good workmanship for their jewelry would make the jewels appear feminine and dainty. Jewelers were having a great time offering substandard men's rings with the claim that they appeared rustic and masculine. That era ended about a decade ago when Kaisilver, released its first collection of quality custom rings for men in gold and silver. The taste of fine jewelry and design was relished by modern men and many jewelers, continue to curse us for this sincere effort. As an example, a men's size 15 ring in gold or 925 silver with or without, a gemstone can have the same quality of craftsmanship as a high end jewel crafted for a stylish lady. Design: The selection of a design for a large men's ring depends on personal likes and dislikes but, design is not just about external appearance and beauty. While we are all aware that the dimensions of a jewel are defined by the design, a well researched design will also take care of a number of other issues. At Kaisilver we prefer designs that use a bezel gem set rather than prongs as prongs, tend to catch in fabric and gradually open up. We advice buyers to go for a low profile on the gem mount, highly protruding gems are more likely to be struck by physical impact and get damaged. Without getting very technical suffice it to say that, our design concepts include many advanced features to enhance the durability of the jewelry . 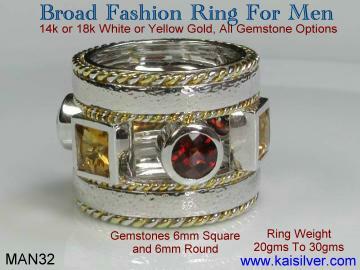 Kaisilver: We have pioneered the skills required to become one of the leading online custom made jewelry providers. The same level of craftsmanship, handpicked gems and designs are ensured for both gold and 925 silver jewelry. We were the first to present the concept of quality men's jewelry and have today become, the preferred source for quality conscious men across the globe. We welcome your own design ideas to be custom made but, you can also pick designs from our website. Our wide range of gem sourcing contacts and expertise, work to your advantage. You need not restrict your choice of gems to what you see on our website. Our support team at sales@kaisilver.com will be glad to assist you with any doubts or queries related to gems and jewelry that you might have. 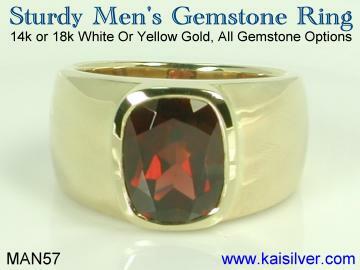 If you wish to have a men's large size 14 or 15 ring gems like ruby and sapphire, give a close look to the MAN13 ruby sapphire ring from Kaisilver. The ring has a 9x7mm oval blue sapphire in the center, the row of rubies around the center stone is followed by a row of white sapphires. The entire gem formation gives the big ring substantial head height without, the need for very high carat value for the center sapphire. You could request for a design modification and have a single row of gems surrounding the center oval gem ... more. A broad ring suited for a ring size of 12 to 14 or even 15, the design can be moderately adjusted to partly reduce or increase the dimensions of the jewel. This is a multi gemstone ring, the size of the gemstones is moderate and makes even gems like ruby and sapphire viable. Modern men have now become more open to creative designs and statement making themes for their jewels. Crafted in all ring sizes in gold or 925 sterling silver. All gem combinations are allowed ... more. Men are known to appreciate jewelry with a meaningful theme or deeper significance. If this is you, the MAN110 men's plain claddagh ring should interest you. 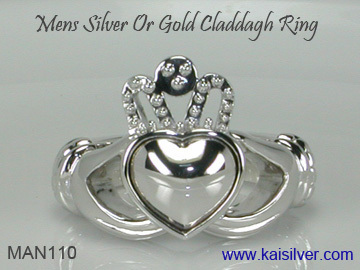 Kaisilver crafts the finest claddagh rings for men and ladies, this is a men's ring and can be custom made in all sizes. The first cladagh ring was made around 4 centuries ago, the jewel is today regarded as the most meaningful jewel in history. This ring symbolizes love, friendship and loyalty. Both gold and silver men's claddagh rings are available with and without gems of your choice ... more. 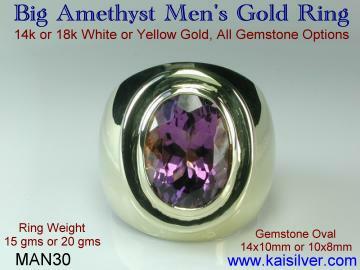 A big mens ring with a single large gem stone in the center, gem size can be 14x10mm or 12x10mm. If you wish to have that big carat look for your men's gold or silver ring in the 12 to 15 size range, go for the MAN30. Firm bezel set gem, low profile setting for the stone reduces chances of the stone getting hit and damaged by physical impact. Gems like white and blue topaz, citrine, amethyst, chrysoprase, tigers eye, green jade, black onyx, red garnet, smoky quartz or agate are all suitable for such large gemstone sizes ... more. If you require a large mens ring but need something with modest dimensions, go for the MAN57 ring in gold or silver. Cushion cut 11x9mm faceted gem options are available for most moderately priced gems. This ring with a head height of around 13 to 15mm is just right for men's size 14 rings or thereabout. The ring can be crafted with a uniform or tapered band width, the choice is yours. The deep red garnet option as shown in the image is extremely popular ... more. Now what if you wanted a large men's diamond ring, something with a size range of 12 to 14 or even up to size 15. Given the steep prices of large diamonds, a mere increase in diamond size is not the solution for most of us. The MAN56 gold or silver diamond ring gives an excellent cost effective solution for men's large diamond rings. The four diamonds in this ring can each have a size of around 3 to 4 mm. You could also combine diamonds and gems in the same ring.This will define a sparkling square in the center of the ring, and the price would be moderated ... more.